Helicobacter pylori (H. pylori) is a spiral-shaped bacterium that lives in the digestive tract of many people. Sometimes it causes no trouble, but it can invade the stomach lining causing inflammation and sometimes ultimately ulcers. H. pylori is very common and many people have it worldwide. One in 3 Australians are thought to be infected with H. pylori, but less than 5% of children are infected. It is almost always present in people with peptic or duodenal ulcers, and is responsible for causing most duodenal ulcers and about two-thirds of stomach ulcers. It is also present in the stomach lining of many patients who have stomach cancer. H. pylori is spread by mouth-to-mouth contact, such as kissing. Infection may also occur by sharing food or utensils with an infected person, or through contact with the vomit or faeces of an infected person. Contaminated food or water is another source of infection. H. pylori infection rates are higher in older people and migrants, and in places with poor sanitation and crowded living conditions. The living conditions when a person was growing up are a good indicator of whether they are infected or not. With increasing standards of hygiene and less overcrowding, the rates of infection are less. However, these symptoms are common in people with and without H. pylori infection and diagnosis of H. pylori infection can only be done by breath test, blood test, stool sample or a biopsy. H. pylori can be diagnosed from biopsies (samples) of the stomach wall taken during an investigation known as endoscopy or gastroscopy. During a gastroscopy, a small flexible tube is passed through the mouth, down the gullet (oesophagus) and into the stomach, allowing a doctor to view the oesophagus, duodenum and stomach. A small piece of the stomach lining can be removed and then tested for the H. pylori bacteria. Gastroscopy is usually done under light sedation and should not cause more than minor discomfort. The presence of H. pylori can also be diagnosed in a simpler way, through breath-testing. The breath test uses the ability of H. pylori to produce an enzyme called urease, which is not normally found in the human stomach. The person undergoing the breath test just has to swallow a capsule, or drink a liquid, containing a tiny amount of a radioactive substance and, about 10 minutes later, blow into a balloon. The balloon is then sealed and its contents later tested in the laboratory. If H. pylori was present in the stomach, certain changes will have happened to the contents of the capsule which can be identified from the breath sample. The amount of radioactivity in the capsule used for this test is extremely low, being about the same as the amount each one of us is exposed to naturally in 12 hours of everyday life. The breath test is often used after a person has had antibiotic therapy, to confirm that the antibiotics have eradicated the H. pylori. Several other tests are available to diagnose the presence of H. pylori. Your doctor will decide which test is most appropriate for you. There is a blood test which detects antibodies your body produces against H. pylori, if you are infected. Stool samples can be tested for the presence of antigens (foreign proteins) associated with H. pylori infection. This type of test is usually used to test for H. pylori in children. Fortunately, it is usually possible to eradicate this bacterium. Just as many other bacteria can be eliminated from the body by antibiotics, so, too, can we get rid of H. pylori. A one- or 2-week course of a combination of 3 medicines (2 antibiotics plus a proton-pump inhibitor – a medicine that suppresses stomach acid) is usually required. This has a very high success rate. This has made life much easier for many people with ulcers who previously had to undergo major surgery or take medicines on a life-long basis. 1. Helicobacter pylori (revised February 2011). In: eTG complete. Melbourne: Therapeutic Guidelines Limited; 2013 Jul. http://online.tg.org.au/complete/ (accessed Feb 2016). 2. Gastroenterological Society of Australia (GESA); Digestive Health Foundation. Helicobacter pylori (H. pylori), August 2010. http://www.gesa.org.au/consumer.asp?id=80 (accessed Feb 2016). 3. National Digestive Diseases Information Clearinghouse (NDDIC). H. pylori and peptic ulcers (updated Aug 2014). http://www.niddk.nih.gov/health-information/health-topics/digestive-diseases/peptic-ulcer/Documents/hpylori_508.pdf (accessed Feb 2016). 4. MayoClinic.com. 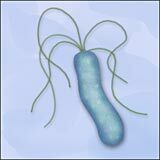 H. pylori infection (updated Jun 2014). http://www.mayoclinic.org/diseases-conditions/h-pylori/basics/definition/con-20030903 (accessed Feb 2016). 5. National Cancer Institute. Helicobacter pylori and cancer (updated Sept 2013). http://www.cancer.gov/cancertopics/factsheet/Risk/h-pylori-cancer (accessed Feb 2016).